Home > Membership > Nonprofit World > Why Don't Board Members Do What They're Supposed to Do? 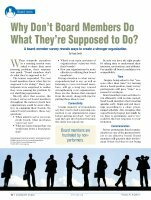 Why Don't Board Members Do What They're Supposed to Do? A board-member survey reveals ways to create a stronger organization.